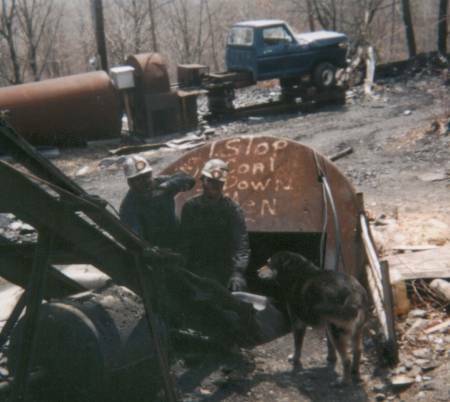 In February 2001 I went to work in one of the last underground / deep anthracite mines still in operation in Pennsylvania. I had been teaching at the Pine Grove Area High School through the Fall and Winter of 2000 as a long term substitute. In January I found my position was ending so began looking elsewhere for employment. 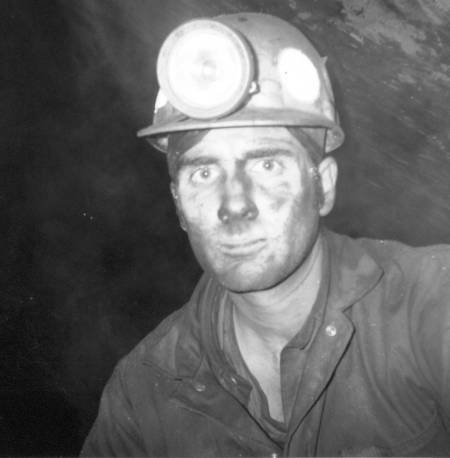 One of my students mentioned to me that her father owned a “coal hole.” I went to see Gary Lucas at his R & R Coal mine and was put to work for one day as a trial. At the end of the shift Gary told me if I got my deep miner certification from the state of Pennsylvania, that he would put me to work in his mine. I then contacted Ken Whittmer of DEP Deep Mine Safety in Tremont. He was very reluctant to give me my training. After a few days of repeated phone calls I began my 40 hours of training. Most of the training was common sense regarding safety in the mines. At the end of the training I had to take a written exam. I passed the exam and received my certificate. I went to work in the R & R Coal mine the next day. I remember being handed a miners helmet, a light, and a belt for my battery. Next they gave me a short handled shovel, made by the Bull Dog corporation, and sent me down in the slope buggy alone. After descending about 300 feet, the Buggy was stopped at the gangway. There Wayne met me and walked me back to the end of the gangway, about 250 feet. At this time the mine had a total of 4 employees; Gary Lucas (head miner), Wayne (laborer), John Guman (outside laborer), Jim (hoister pronounced “heister”), and myself (laborer). As you travel back the gangway, there were 6 chutes traveling from the gangway, up to the left at about a 40 degree pitch. Each chute went up about 250 feet and stopped. Between the chutes were intact pillars of coal for roof support. 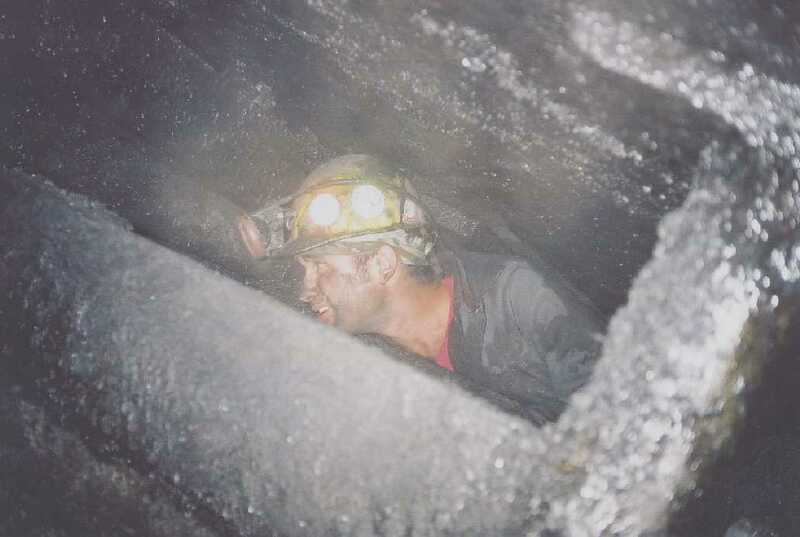 In February 2001, when I started in the mine, we were only working in chute #6, the others were abandoned. At that time, the chute had only one access point, a small manway chute built between the chute on the right and the wall of coal on the left. Once this chute was advanced about 30 feet up, a side cut could be made which attached this chute to chute #5 with what is called the miner heading. 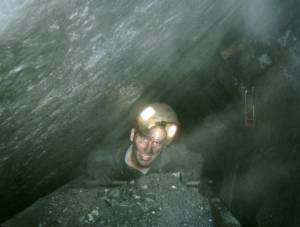 During my first week in the mine, I was entering the chute through the bottom manway and began walking on top of the loose coal towards the face or the working section of the mine. As I tried to walk on the loose coal, it began to shift like quick sand. More coal came down in sheets like and avalanche as I struggled. Before I knew it, I was buried up to my neck in coal. I have heard of several miners dying in this manner and wasn’t in the mood to join them yet. I found that if I moved very slowly I was able to free one arm and slowly dig the rest of my body out without bringing more coal on top of me. The key to walking on loose coal is to keep moving your feet at all times. Lesson learned. The typical process of events for a day shift was as follows. The morning would start about 7am in the miner’s shanty. The miners would change into their working clothes. These included steel toe boots which were required by law. Miners then had to remove all rings and jewelry for safety. In the shanty there was a board with all our names on it. There were two hooks by each of our names. When outside the mine, we hung a tag on the out hook, when in the mine I hung my wedding ring. This board was there in case of an accident. Some one can take one look at the board and see how many men are in the mine at that time. Once we had our clothing on, we’d grab out hard hats and a freshly charged battery and light and head to the slope. This mine was a slope because the entrance was on an angle. Flat entrances are called drifts or tunnels. Entrances that go straight up and down like an elevator are called shafts. We had to take the entire days supplies in with us in the morning. This would include several mine props or timbers, oak mine boards for building / repairing chutes, and often a 40 pound box of explosives. Our explosives were made by the Pennex company and delivered once a week from Kulpmont. Once lowered into the mine to the gangway, Jim would stop the slope buggy and we’d climb out onto a wooden platform and unload our gear. We then had to shimmy about 30 feet back the gangway until we reached the gangway buggy. The gangway buggy held about 1 ton of coal and road on steel mine rails. The rails ended about 30 feet from the slope buggy and dumped into a chamber called the counter chute. We usually loaded our props, boards, and explosives into the buggy and pushed it back to chute #5. We would carry all the supplies by hand up chute #5, to the miner heading. Then cross over into chute #6 and continue traveling up to the face. The face is the point where coal was most recently being worked. Once at the face, we would dig hitches for our props. These were small sockets made into the mine floor using a pick. The props were made with a point on the bottom end. This point was placed into the hitch, this would allow for less chance of the prop slipping out of position when the next round of explosives was set off. Often the timbers were too long and had to be sawed by hand to achieve a tight fit between the floor and the roof. An oak board about 3 or 4 feet long was placed on top of the prop to spread out its support to the roof. Props were places about 6 feet apart. Both 6 feet from the set of props below and to the sides. Once the props were in place, a mine board was placed across the base of the props. This was the platform for the miner to now stand on to begin drilling. Our drill was made by Rolls Royce and ran off of pressurized air. A rubber hose about 2 inches in diameter ran all the way down the chute, out the gangway, and up the slope to an air compressor on the surface. We had a crude intercom in the mine and when the miner was ready to drill, I’d holler thought the intercom to turn on the air. The drill bit Gary used was about 8 feet in length and called the “steel.” The usual drill set was about 20 feel wide, with holes about 2 feet apart. The vein of coal in chute #6 was usually 3-4 feet thick; however it did pinch down to 19 inches at one point which made work very difficult. The drilling was very noisy and dusty. A chew of tobacco was a must at this point. The drill was controlled with a throttle like on and off switch. One day the switch was broken and the only way we could operate the drill was for me to pinch the hose shut when Gary wanted the drill off and to open the pinch when he was ready to drill. Trying to pinch a 2 inch hose with several hundred pounds of pressure wasn’t one of my favorite jobs in the mine. Once the holes were drilled, usually about 15 total, we would make out explosives and place them in the holes. We would place timer caps in each stick of power by pushing it into the power with our thumbs. If any of the powder got on your skin you would have a terrible headache from the nitro. Each blasting cap had a number on it that represented how many milliseconds it would take to go off. They ranged from 5 to 20 as I remember. The reason for the different times was to allow for a series of explosions to better break up the vein of coal. This truly was a science and Gary was very good at it. Usually you wanted to the charges in the middle to go first, so they would have the shortest timer, then progress until you reach the outer charges. Too big of an explosion blew the coal to powder, which wasn’t as marketable and too little explosive didn’t break the coal up. Once the timers were placed into the powder, the charge was tamped back into the holes using a wooded stick like a broom handle. Once all the charges were set, we would run blasting wire from the charges, down to a heading. Once the detonator was hooked up, we would holler “Fire” and set off the explosion. If all went well, about 15 tons of coal should come down the chute and stop at the wooden chute structure just above the gangway. I would then head into the gangway and load the buggy with coal from the chute. A wooden board would be lifted on the chute which allowed coal to run into the buggy. Once full, the board was put back in place and the coal would stop running. Occasionally a rock would get jammed in the chute and coal would continue to run over the buggy and onto the tracks. There was not much room in the gangway and clearing the coal away from the buggy wheels was a miserable job. The 1 ton buggy was then pushed by hand out the gangway and dumped into the counter chute. The counter chute could hold about 18 tons of coal. This allowed a stock piling place to dump the coal. Once the counter chute was full, I would head down to the lowest point in the mine where the counter chute met the slope buggy. Using a bell system, I would signal for the slope buggy to be lowered to the counter chute. I would then lift the chute board and fill the slope buggy. Once full I would ring the bell and Jim would hoist the coal out of the mine. The bell system was as follows; 1 ring stop, 2 rings buggy up, 3 rings buggy down, 4 rings men up, 5 rings turn on air. Once the slope buggy came out of the mine, it was raised on top of the tipple. The tipple would dump the buggy and now John would hand separate any rock in the coal. The coal then would slide into a pile and wait to be loaded onto trucks and headed for the breaker. 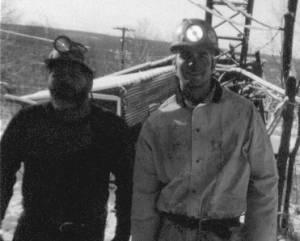 The time period when I worked full-time for R & R Coal was February, March, and April 2001. I continued part-time work through the remainder of the year, with my last day underground being in November of the same year. We often worked 6 days a week. Although we started at 7 am sharp, we ended our shifts at different times depending on the job at hand of what situation our progress was in for that day. Our goal was to get out at least 20 tons per day. On several occasions I remember working passed 5 and even 6pm. There was no way for me to call my wife which often worried her quite a bit. I was paid $2.50 for every ton of coal we mined. If we mined 20 tons, I made $50 that day. There were some days when we spent the entire day fixing something in the mine such as setting iron rail, fixing the slope buggy or gangway buggy, or cleaning up a roof fall. This was all unpaid work. On one occasion I came to work and was told that the shift before a miner had been trapped by a fall of coal from the chute. He was buried under several tons of coal. He had been rescued with minor injuries. However the task remained of cleaning up the damage to the chute and shoveling the coal from the gangway floor. I shoveled 7 gangway buggies full by hand. During the effort I was hit in the head with a loose mine board. The collision broke the light on my hat. I was in the mine alone at the time and the intercom was still out of order from the accident the day before. I found myself alone in total darkness. I could hear running water which headed out the gangway and spilled down the slope. Our slope attached several hundred feet below to an old mine from the 1800’s. If I took a wrong step and fell down the slope I would almost certainly have died. I remembered an old miner telling me to slide my foot along the inside of the mine rail until I reached the slope. I did this, but had to be careful as our gangway ended at a complete drop off into the counter chute which leads into the slope. I listened to the running water and tried to determine how far I was from the counter chute drop off. I was about to continue walking, confident I was dozens of feet from the drop off, when I bumped the glow light on my wrist watch. The light was enough that I could see a vast drop off only one step ahead of me. Had I not bumped my light on my watch, I would have fallen down the shaft. I used the light on my watch to continue to the slope buggy. I then gave the bell signal and was hoisted out of the mine where I was handed a new light and sent right back down to work again. During my time at the R & R slope, we were also working on opening a new slope about 100 yards away into another vein of coal. We believed this vein to be the Buck. We preceded about 75 feet down over the time I was employed there. The vein was much thicker, about 6 or 7 feet but was very boney and filled with dirty coal. Gary hoped that if we continued the vein would become more pure. I am unsure of the current status of that slope. 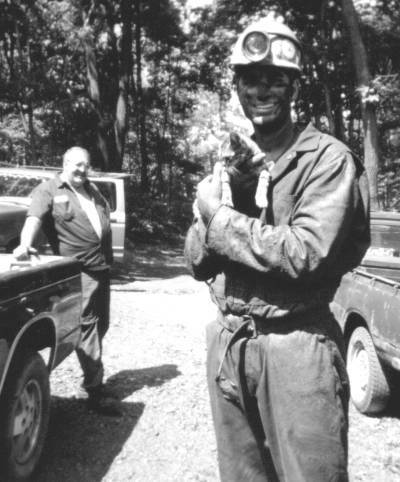 Last I heard (August 2004) the mine I worked in was being worked by Gary and his brother Bimmer Lucas. I still continue to keep in touch with Gary and a few other friends I made in the mines. If it were not such a risk to me and my family, I would be very happy living the life of a Pennsylvania coal miner. Van and Gary Lucas (head miner) heading into the mine.R&R Coal Co.
Van working the chute in the gangway. The coal comes down the chute, and into the buggy...HOPEFULLY! Otherwise the shoveling starts. Once the buggy is full, we push it several hundred feet through the gangway, and dump it into the "counter shoot." The buggy weighs over 1 ton full and is moved strictly by muscle and sweat. Down inside, in the gangway. Gary Lucas and I, after a days work. Snow on the ground, soaking wet and tired. 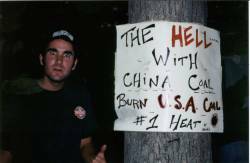 August 11th, 2001 at the annual independent coal miners picnic. One of my favorite pictures. Me and the mine cat. Every good mine should have a cat.